Vocational Rehabilitation shares a success story of how innovative accommodations can help employees do their jobs better in honor of the 25th Anniversary of the Americans with Disabilities Act. Michael Sardinas pushes his specialized cart down the hall at Tampa Crossroads, a non-profit that offers a variety of services to people in need. He [Michael] is a perfect example of perseverance. Michael Sardinas pushes his specialized cart down the hall at Tampa Crossroads, a non-profit that offers a variety of services to people in need. As the IT assistant, he’s the go-to guy to fix the office computers, install computer programs, and make sure their 60 employees are electronically connected. At first glance, his cart looks like any old cart loaded with computer equipment, but it’s not. You see, Michael has Cerebral Palsy and as he explains, “I’m strong in the arms but not in the legs.” So in order to keep the cart from rolling away and taking him with it, the rehab engineers at the University of South Florida (USF) fashioned a special hand brake for Michael to stop the cart and hold it steady. 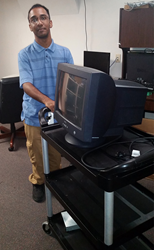 This small accommodation, provided by Vocational Rehabilitation (VR), was all he needed to do his job better. Michael began fixing computers at an early age. By the time he was in high school, he was working at his cousin’s computer store. He took computer tech classes in high school, and at 17, he began working at Best Buy at the tech bench, now known as the Geek Squad. Michael had found his passion. He took some classes at Hillsborough Community College and began applying for jobs, but they were slow in coming, so he started fixing computers in his home. He became very popular in the neighborhood as the “computer guy,” but he wanted a little more, so he came to VR to apply for services. VR helps people with disabilities get or keep a job. His VR counselor referred him to Hector Ferrer, employment specialist for Tampa Crossroads. Hector helped Michael update his resume and apply for jobs. Michael went on numerous job interviews, but something always kept him from becoming employed. Sometimes the company wasn’t on the bus line, so transportation was an issue. Some business owners were scared Michael would fall because he’s not very stable when he walks. Thanks in part to the Americans with Disabilities Act (ADA), the world’s first declaration of equality for individuals with disabilities, it was automatic for Tampa Crossroads to provide this accommodation for Michael. In the 25 years since it became law, the ADA has worked to eliminate discrimination on basis of disability in all areas of public life. The 25th anniversary of the ADA on July 26, 2015 is a time for celebration of its victories. Florida’s Vocational Rehabilitation (VR) is a federal-state program committed to helping people with disabilities become part of America’s workforce. Our employer-focused website, http://www.FLJobConnections.com, allows businesses to search at no charge for employees who are ready to go to work, as well as to post available jobs. VR has 90 offices across Florida, and last year helped 7,214 Floridians with significant disabilities find or keep a job. For more information about VR and its services, call (800) 451-4327 or visit http://www.Rehabworks.org.